"Red Ash" redirects here. For other uses, see Red Ash (disambiguation). Fraxinus pennsylvanica, the green ash or red ash, is a species of ash native to eastern and central North America, from Nova Scotia west to southeastern Alberta and eastern Colorado, south to northern Florida, and southwest to Oklahoma and eastern Texas. It has spread and become naturalized in much of the western United States and also in Europe from Spain to Russia. Other names more rarely used include downy ash, swamp ash and water ash. Fraxinus pennsylvanica is a medium-sized deciduous tree reaching 12–25 m (39–82 ft) (rarely to 45 m or 148 ft) tall with a trunk up to 60 cm (24 in) in diameter. The bark is smooth and gray on young trees, becoming thick and fissured with age. The winter buds are reddish-brown, with a velvety texture. The leaves are 15–30 cm (6–12 in) long, pinnately compound with seven to nine (occasionally five or eleven) leaflets, these 5–15 cm (2–6 in) (rarely 18 cm or 7 in) long and 1.2–9 cm (1⁄2–3 9⁄16 in) broad, with serrated margins and short but distinct, downy petiolules a few millimeters long. They are green both above and below. The autumn color is golden-yellow and depending on the climate, Green Ash's leaves may begin changing color the first week of September.[where?] The flowers are produced in spring at the same time as the new leaves, in compact panicles; they are inconspicuous with no petals, and are wind-pollinated. The fruit is a samara 2.5–7.5 cm (1–3 in) long comprising a single seed 1.5–3 cm (5⁄8–1 1⁄8 in) long with an elongated apical wing 2–4 cm (3⁄4–1 1⁄2 in) long and 3–7 mm (1⁄8–9⁄32 in) broad. It is sometimes divided into two varieties, Fraxinus pennsylvanica var. pennsylvanica (red ash) and Fraxinus pennsylvanica var. lanceolata (Borkh.) Sarg. (syn. var. subintegerrima (Vahl) Fern. ; green ash) on the basis of the hairless leaves with narrower leaflets of the latter, but the two intergrade completely, and the distinction is no longer upheld by most botanists. It is the most widely distributed of all the American ashes, although its range centers on the midwestern U.S. and Great Plains. The natural habitat of green ash is almost exclusively stream sides and bottomlands. The large seed crops provide food to many kinds of wildlife. Green ash is threatened by the emerald ash borer, a beetle introduced accidentally from Asia. Asian ashes have a high tannin content in their leaves which makes them unpalatable to the beetle, while most American species (with the notable exception of blue ash) do not. A common garden experiment showed that green ash is killed readily when exposed to emerald ash borer, while the Asian species F. mandschurica shows resistance against emerald ash borer. The United States Forest Service has discovered small numbers of green ash in the wild that have remained healthy after emerald ash borer swept through the population. The possibility of these trees possessing genetic resistance to the beetle is currently being investigated with the hope that green ash could be restored using the surviving trees. Winter twig of Fraxinus pennsylvanica. Green ash can usually be distinguished from white ash (F. americana) by its D-shaped leaf scars. In F. americana, the lateral buds are more deeply recessed within their corresponding leaf scars, giving the latter a more C-shaped appearance. The spread of emerald ash borer was facilitated by the extensive use of green ash as an ornamental tree in the central U.S. following the loss of American elms in the 1950s-60s due to Dutch elm disease. That epidemic was the result of a similar overuse of elms in urban environments, leading to a monoculture that lacked any disease or pest resistance. Scientifically for green ash this is because modern cultivars utilized regionally were parented from sometimes only four individual trees selected for unique traits and male seedless flowering. Proclaiming a harsh lesson learned, cities like Chicago did not replace dead elms with a 1:1 ash:elm ratio. Instead, Norway, silver, red and sugar maples, honey locust, linden/basswood, redbud, crabapples and hackberry, among others, were also utilized during this recovery period and in new urban and suburban areas. Fortunately, with these additional species, many cities were able to reduce the percent of ash and other species to much lower levels (20% average) than during the Dutch elm disease era where from 56% to 100% of the trees were elm. Injections and spraying of ashes with pesticides has been used in city parks to protect valued trues from emerald ash borer. Record cold temperatures during the winter of 2018-19 are estimated to have killed as much as 80% of ash borer larva in the Upper Midwest. Both American elm and green ash were extremely popular due to rapid growth and tolerance of urban pollution and road salt, so many housing developments in Michigan were lined from end to end with ashes, a result of which the beetles had an enormous food supply to boost their population well above Infestation thresholds. The tree was also extensively propagated and sold by local nurseries. According to the American Nursery Industry, "Back in the late 1980s, Dr. Frank Santamour Jr., then a research geneticist with the U.S. National Arboretum, proposed the 10-20-30 formula for diversity in the urban forest, limiting the plantings in a community to no more than 10 percent within a single species, 20 percent within a genus and 30 percent within a family."" Many communities are using a more strict 5-10-20 rule today, because of the threat posed by emerald ash borer. The emerald ash borer proved to be a far worse and potentially more serious threat than epidemics of the past such as chestnut blight and Dutch elm disease because those diseases spread at a slower rate, only affected one species, and did not kill the trees before they could attain reproductive maturity. 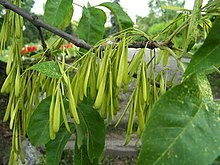 Many areas have banned the sale of ash seedlings in nurseries, although seeds may be sold as they are not a vector for the insect. Green ash is one of the most widely planted ornamental trees throughout the United States and much of Canada but mostly Alberta, including in western areas where it is not native. It is also widely planted in Argentina. It is very popular due to its good form and resistance to disease. About 40% of boulevard trees in Edmonton, Alberta are green ash. For the last two centuries American elm and ash, which both belong to the ancient Elm-Ash-Cottonwood Bottomland ecosystem, achieved distinction as North America's two most popularly planted urban species, used primarily for their superior survival traits and slowly maturing 180–300 year majestic natural beauty. Today used as living national monuments, the National Park Service is protecting Thomas Jefferson's 200-year-old planted example, and George Washington's 250-year-old white ash which has a 600-year possible lifespan. Green ash had been widely used as a primary ornamental and long lived monument tree until the elm fad of the 1880s, and regained top position once again after Dutch elm disease arrived. Other continents learned of American ash species' urban survivability and unique beauty through the worldwide popularity of Midwestern Prairie style ecology and architectural movement. Modernizing cities in Russia and China then began using imported green ash a century ago to line streets and landscape new public parks. When one Chinese city's original collection, which had survived into late 1980's suddenly all died, city fathers used trees by sending them back to America as wooden crates containing Chinese made parts supplying the American auto industry. Advantages of green ash include its tolerance of harsh urban environmental conditions, ease of propagation, and (in eastern North America) its value for wildlife as a native keystone species. North American native ash tree species are used by North American frogs as a critical food source, as the leaves that fall from the trees are particularly suitable for tadpoles to feed upon in ponds (both temporary and permanent), large puddles, and other water sources. Species such as red maple, which are taking the place of ash, due to the ash borer, are much less suitable for the frogs as a food source — resulting in poor frog survival rates and small frog sizes. It is the lack of tannins in the American ash varieties that makes them good for the frogs as a food source and also not resistant to the ash borer. Varieties of ash from outside North America typically have much higher tannin levels and resist the borer. Maples and various non-native invasive trees, trees that are taking the place of American ash species in the North American ecosystem, typically have much higher leaf tannin levels. Ash species native to North America also provide important habit and food for various other creatures that are native to North America. Green ash wood is similar in properties to white ash wood, and is marketed together as "white ash". The commercial supply is mostly in the South. It is very popular, used in making electric guitars because it can be somewhat lighter than white ash without sacrificing too much in tone. [dubious – discuss] It has a bright sound with long sustain, plus the wood grain is aesthetically desirable to many guitar players. [dubious – discuss] Gibson, Fender, Ibanez, Warwick, M2Guitars and many other luthiers use ash in the construction of their guitars. Wikimedia Commons has media related to Fraxinus pennsylvanica. ^ a b Kennedy, Jr., Harvey E. (1990). "Fraxinus pennsylvanica". In Burns, Russell M.; Honkala, Barbara H. Hardwoods. Silvics of North America. Washington, D.C.: United States Forest Service (USFS), United States Department of Agriculture (USDA). 2 – via Southern Research Station (www.srs.fs.fed.us). ^ a b "Fraxinus pennsylvanica". Germplasm Resources Information Network (GRIN). Agricultural Research Service (ARS), United States Department of Agriculture (USDA). ^ "Fraxinus pennsylvanica". World Checklist of Selected Plant Families (WCSP). Royal Botanic Gardens, Kew. ^ "Fraxinus pennsylvanica". County-level distribution map from the North American Plant Atlas (NAPA). Biota of North America Program (BONAP). 2014. ^ Rebek, Eric J.; Herms, Daniel A.; Smitley, David R. (1 February 2008). "Interspecific Variation in Resistance to Emerald Ash Borer (Coleoptera: Buprestidae) Among North American and Asian Ash (Fraxinus spp.)". Environmental Entomology. 37 (1): 242–246. doi:10.1603/0046-225X(2008)37[242:IVIRTE]2.0.CO;2. PMID 18348816. ^ Knight, Kathleen S.; et al. (2012). "Dynamics of surviving ash (Fraxinus spp.) populations in areas long infested by emerald ash borer (Agrilus planipennis)". Proceedings of the Fourth International Workshop on the Genetics of Host-parasite Interactions in Forestry: Disease and Insect Resistance in Forest Trees: 143–152. ^ Koch, J. L.; Carey, D. W.; Mason, M. E.; Poland, T. M.; Knight, K. S. (21 June 2015). "Intraspecific variation in Fraxinus pennsylvanica responses to emerald ash borer (Agrilus planipennis)". New Forests. 46 (5–6): 995–1011. doi:10.1007/s11056-015-9494-4. ^ "Fraxinus comparison chart". www.uwgb.edu. Retrieved 2018-11-11. ^ Cook, Bill. "Forest management guidelines for Michigan". Michigan SAF Home Page. Michigan Society of American Foresters. Retrieved 5 July 2015. ^ "Ash Tree Identification". New York Invasive Species Information. Cornell University Cooperative Extension. Retrieved 5 July 2015. ^ a b c Stephens, Jeffrey; Bervan, Keith; Tiegs, Scott (3 May 2013). "Anthropogenic changes to leaf litter input affect the fitness of a larval amphibian". Freshwater Biology. 58 (8): 1631–1646. doi:10.1111/fwb.12155. ^ Hilty, John (2016). "Black Ash (Fraxinus nigra)". Illinois Wildflowers. Retrieved 27 August 2018. This page was last edited on 2 April 2019, at 19:54 (UTC).